Let me explain using visual aids. My daughters love taking videos of their father doing silly things. 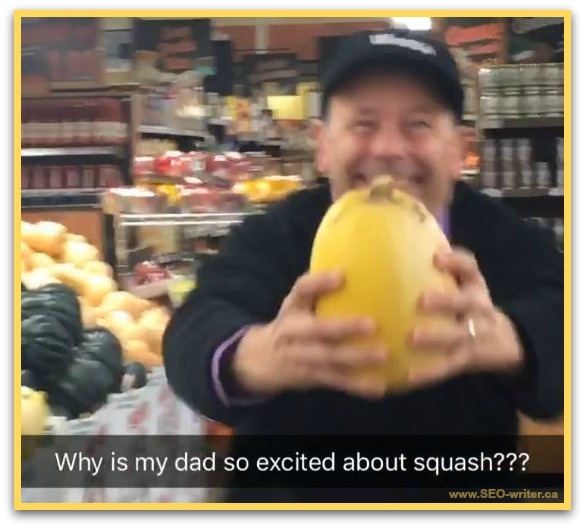 So when I came running at them in our local Foodland, all excited about a squash, they couldn’t resist rolling the camera. Take a look; it’s only two seconds. Yes, that’s a squash I‘m carrying. And yes, I am hyper excited about it. A squash is pretty boring. On the excite-o-meter, I would place it somewhat above bathroom mold and somewhere below Wednesday afternoons. But I got excited about it. What three things do all these topics share in common? They are all of enormous interest to the client who wants them written. They are all probably of interest to somebody else (hopefully) who will want to read them. They are all probably the last thing you would want to write about. But you are a ghostwriter. And writing about these fascinating topics is your job. You have to capture the excitement of your client. You have to be able to express that excitement in words. If you don’t get excited, it will show. Your copy will be ho-hum. You have to be easily excited to do a good job as a ghostwriter. Some ghostwriters listen to their clients talk. They let the infectious excitement of their clients spread to them. If you keep your mind open, it’s not hard to do. Others look at the topic, review their notes and think excitement. They find something to be excited about in each topic. A new baby is born! Two widgets get hooked together! The accountant will make more money! Everything gets more exciting with an exclamation mark, and that includes mental exclamation marks. It also includes vocal exclamation marks. So say it out loud. Say it with excitement. If it sounds exciting, and you mind is open, you’ll feel the excitement. You could even get excited about a squash. Because you might have to write a client’s book about squash. Oh, and about that squash. We had been meaning to pick up a spaghetti squash for some time, and I had finally remembered to do it. So, yes, I had a good reason to be excited.